Using one of Tanda’s Managed Award Templates takes the guesswork and stress out of award rate compliance, ensuring the correct award rate is applied correctly every time, for every employee. If you can't see the Award you pay under listed or you pay from an EBA, Tanda can provide a quote to have this built in as custom for you, otherwise you can also build your own rules. Just scroll to the bottom of the page to find the relevant information. 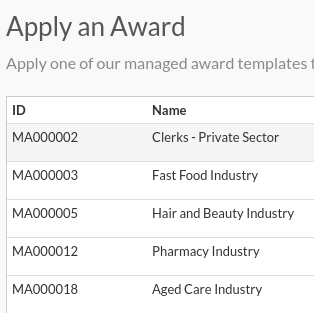 Next, you will classify which staff are on which award and their Employment Type and Level. For further information on this have a read of the Classifying Staff on the Managed Award article. The final step is to integrate Tanda with your Payroll system. This needs to be done after you have completed your last payrun in your existing practice as Tanda may change the way this occurs. It will also need to be done before you're ready to export your first payrun from Tanda, or allowing a bit more time than normal when you complete your payrun. For more information on completing this integration, check out the Payroll Integration article.